Hamsters are usually pretty resilient, and you're not really going to see a broken bone very often, but when it happens it can be scary for you and your little guy. Broken legs aren't as big of a concern with larger animals because the vet can easily bandage and splint the limb, but with a hamster, the limbs are already so small. The picture to the right is a surprising picture, as it's just not common. This particular hamster ran into a cat, and his tibia was broken. 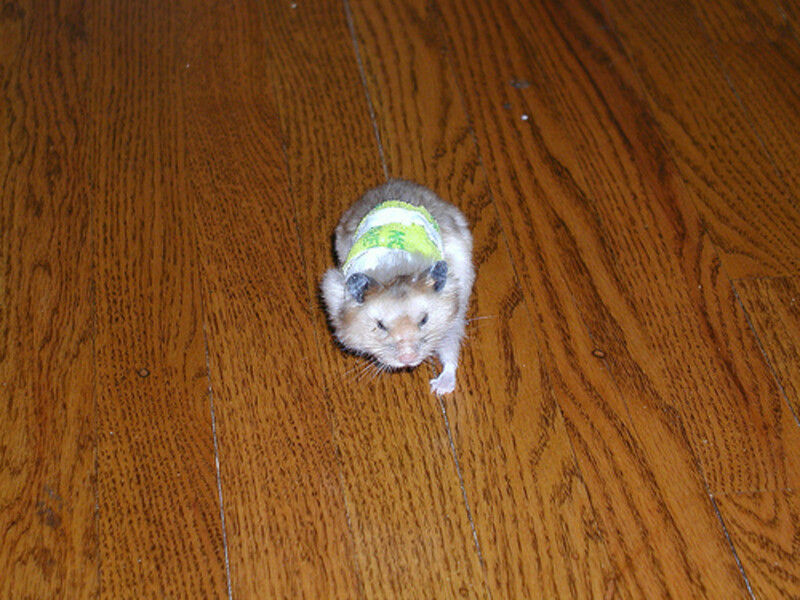 The hamster's owner was married to a Vet Tech at a feline veterinary hospital, where they bandaged the hamster as such. 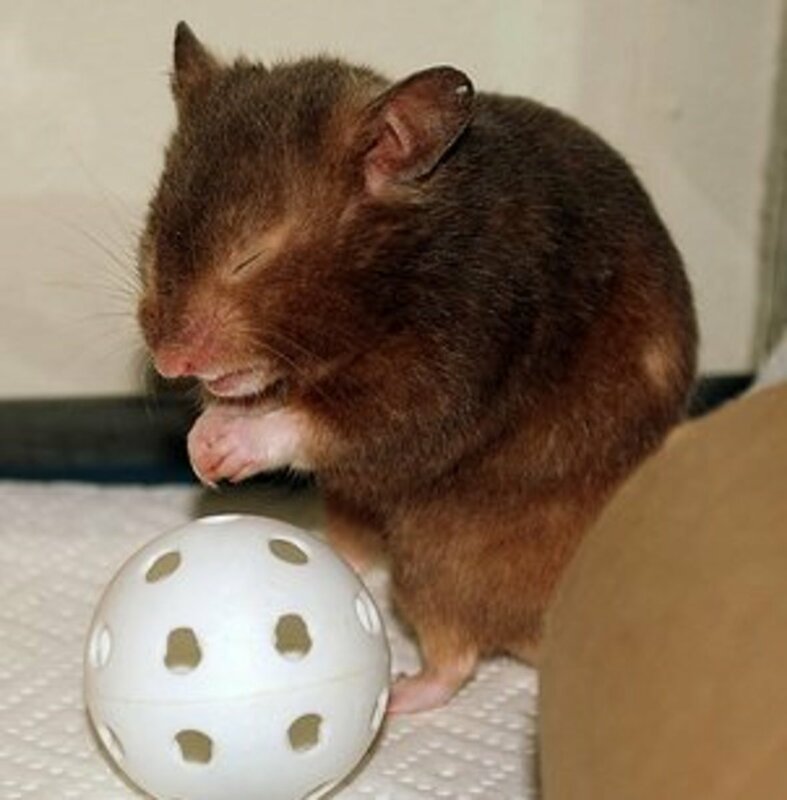 Generally, a broken limb is treated by letting the hamster relax and settle down, which the body naturally heals the bone. 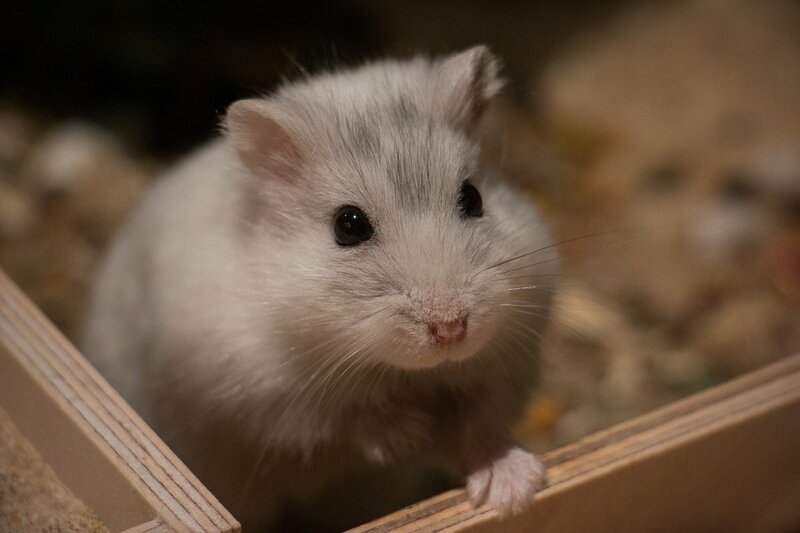 Each hamster will be a little different, but you'll find that the most common signs that your hamster has broken a bone are going to include at least one, if not more of the following signs. If you think that your hamster may have a broken leg, you want to carefully examine him and then immediately take him to the vet. Generally, there's not much that the vet will be able to do because it's not like a human or dog breaking a leg- the vet just won't be able to wrap it up with a splint. But, the vet may prescribe and antibiotic, anti-inflammatory, or pain medicine to prevent infection and aid in the pain. You want to remove the wheel, ladders, and toys in the cage, as well as blocking any tunnels. 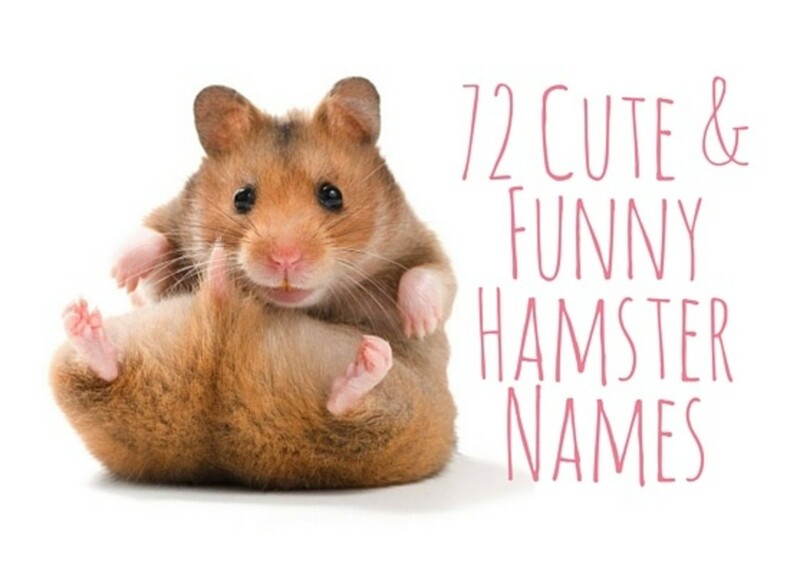 You don't want the hamster to put any more strain on the leg than he has to; if you have a wire cage, consider just putting the hamster in an aquarium until the hamster leg has healed to prevent him from climbing on the bars and wires. If you're able to, lower the water bottle so that the hamster doesn't have to try so hard to get a drink. If the hamster is housed with other hamsters, move him to his own cage until the leg has healed or the hamster has chewed it off. For light or mild breaks, it should only take about 2 weeks to heal, but if the break was severe and the bone was outside of the skin, it may take longer, if the hamster doesn't chew off the limb first. 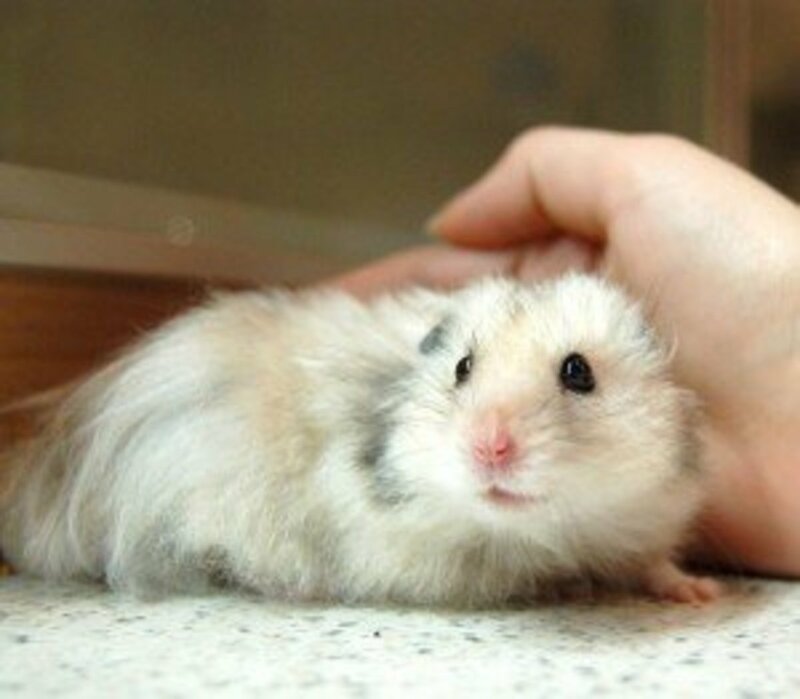 If you notice any complications while healing, such as the hamster completely dragging the leg, go back to the vet because you want to avoid an infection as best as you can. The limb may not heal straight, and the hamster may have a limp, but a limp or a crooked leg won't affect the hamster long-term. The best way to treat a broken bone is to prevent one. You want to make sure to carefully handle your pet hamster. You want to be on the floor, bed, couch, or sitting down somewhere; this way if the hamster tries to jump the surface isn't too far away- as long as you're holding the hamster over the bed or couch not over the floor while you're sitting down. Do not leave your hamster unattended because they have very poor eyesight and will jump even if the floor is several feet away. If you have young children, don't let them handle the hamster unattended, as they can hurt the hamster by accident. Make sure that you have a plastic wheel for the hamster versus one that is made of wire. The wire wheels are dangerous because while running, the hamster can get his feet caught in the wires and break the leg. 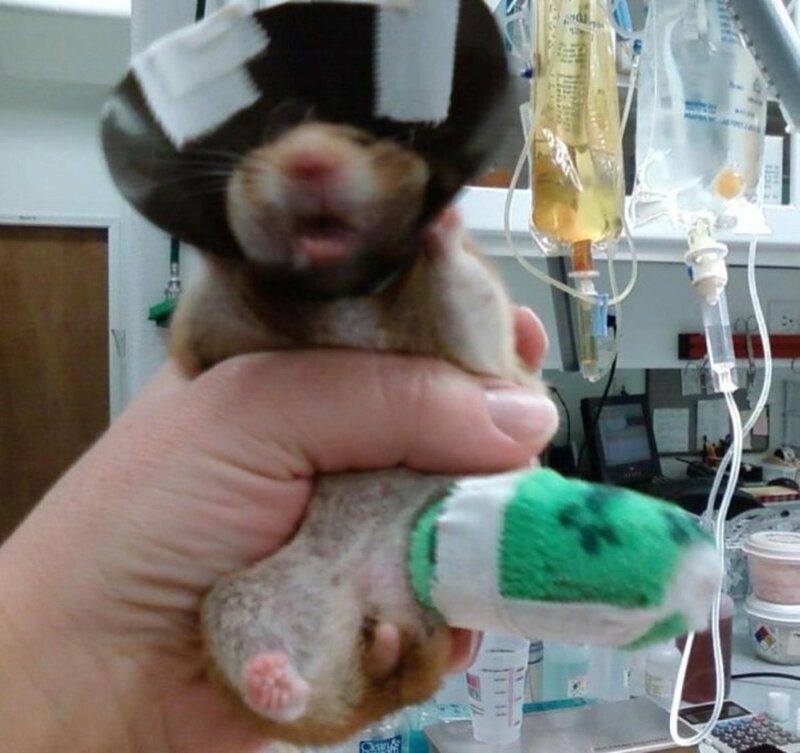 The picture to the right shows another hamster who has been bandaged from a broken leg. This broken bone was caused by hamster aggression. 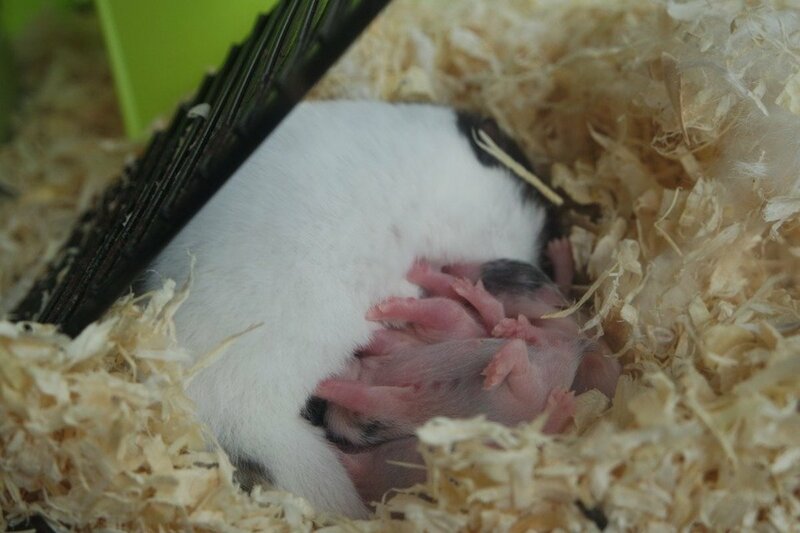 Generally the two male hamsters were kept separate, but one of the cages was accidentally left open, and the hamster climbed to the other cage, where the enclosed hamster bit the one and then pulled the leg. 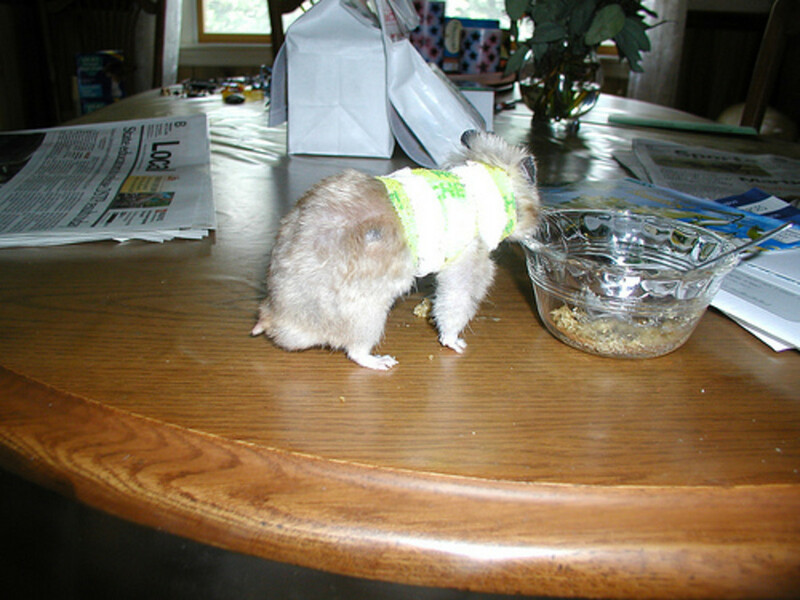 The hamster with the broken limb possibly jerked backwards which caused most of the damage to the limb. The bandage in this case is essentially like an ACE bandage. It is made of a chew deterrent wrap to keep the body at a natural splint. The broken arm is bandaged within the wrap so that it is immobilized. 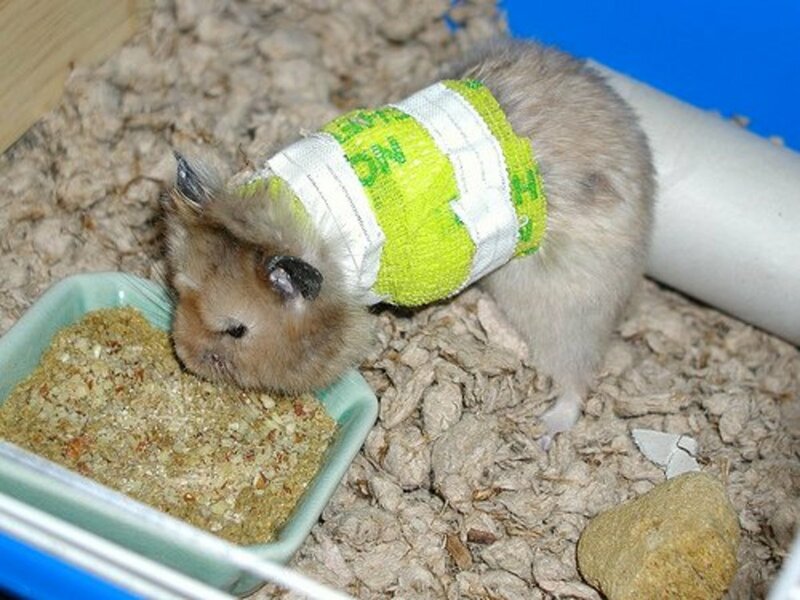 The bandage is large so that the hamster cannot remove it, but it's just right to keep the broken leg from moving around. my hamster has a broken arm not a broken leg and he can't really eat or walk (he can barely walk 3 inches) what should I do? I Hope that the hamster is doing better. My hamster has a wet tail and is limping all the time what cane I do? How do I notice if my hamster is scared of me? Hello, can someone help me please? my hamster has this ceramic cup which I used for her house, I only tilted the cup sideways so that she could sleep inside the cup, she really loves sleeping there, then awhile ago I was cleaning the cage then accidentally I somehow flipped the cup upside down, the edge of the cup went flat on her arm...now she can't move it and I really feel bad about it, her arm looks like it's been folded into half, what should I do? I came home to my hamster dragging both of his back legs, I looked on Google and they said cage paralysis but he has a cage big enough for a rat and I clean his cage once a week. I called the quakertown emergency vet and they said we have to make an appointment witch they don't have an open one for about a week. I've called 4 emergency vets in our area and nobody is helping me, I'm freaking out and no one is helping us at all. I just really hope he isn't paralyzed. What should I do in the mean time?? my hamster trapped her leg in the cage door yesterday and it was bleeding and the fur is all gone. i looked her over today and the leg is greyish and the claws are red. what should i do? 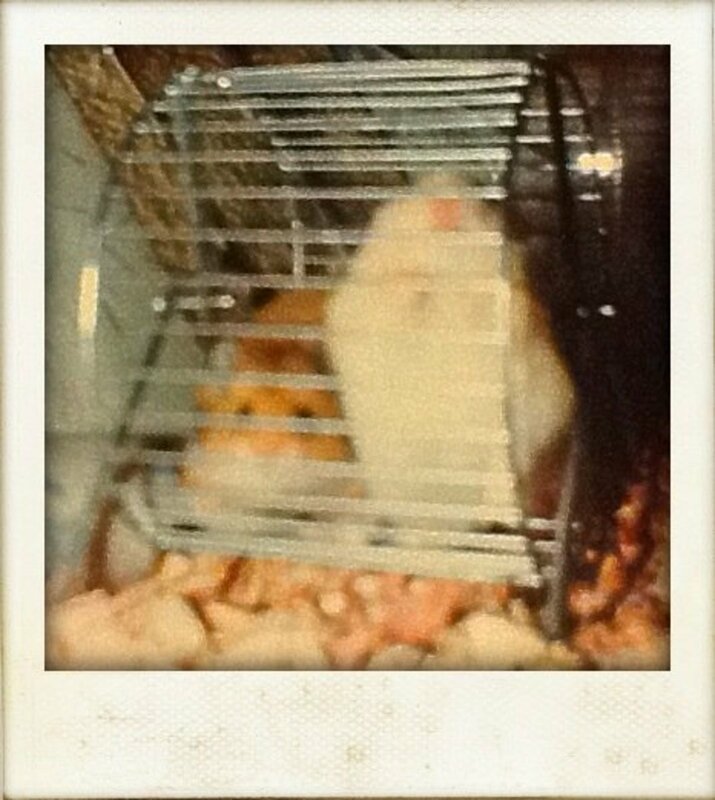 My hamster, Carmel, jumped off the third floor of her hamster cage. She is now dragging her leg and limping. At first, she kept falling over. I'm not sure if that is still an issue, because all she's doing is sleeping. I've read that they can die from pain, or not eating and drinking from the pain. I have another hamster in the cage with her, Hershey. Hershey is being a great little nurse, but some websites say I should separate them until Carmel is healed. Is that necessary. I'm not even sure if it's a broken leg. I'm very scared for my little hamster's life and happiness. What should I do to help her. I've already removed bathing sand. 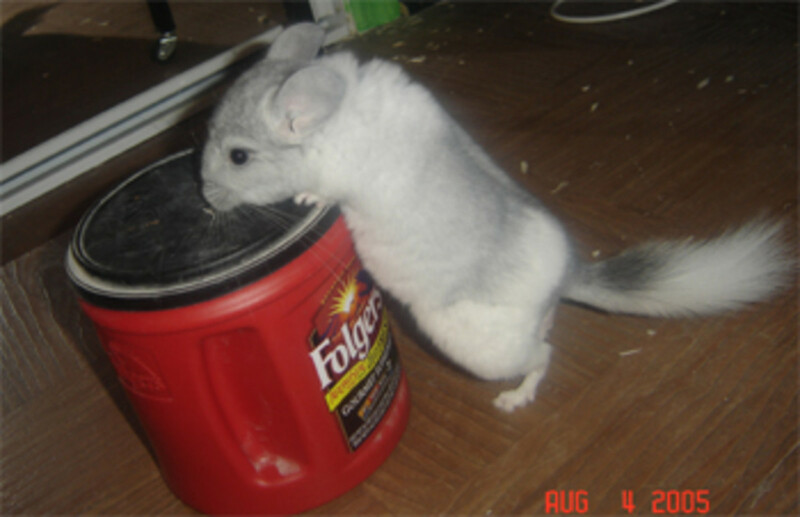 My youngest daughter has a chinese hamster (MILO) and yesterday she realized that it was dragging its back leg, so we took him to the Vet and he said that Milo indeed had a broken limb and said that the only solution was to amputate....to me this did not sound as a "solution", so today we are seeing someone else who can hopefully help Milo..... so last night at home there was a lot of crying and worrying. If anyone can help or give me some suggestions that would be great. Thank you! i brought my hamster to a vet and was advised to take ascorbic acid (vitamin C)... isn't it harmful for my hamhams? My hamster is lying in one corner not moving much or not drinking and eating much its eyes are closed what should i do?? my hamster fall and it almost died but i put it under cold water it was not waking up i put it under cold water it started moving i put it in a box but i did not put the top i put the 3 babies in it to make it jolly and then i put the mother in but she did not drink milk she is the oldest her name is yasmin then she went to the conner and sleept she did not eat and she did not drink water. i think one of her bones is broke because one of her sides is flat and the other is fat what should i do ? what should i do to see if one of her sides is broken?